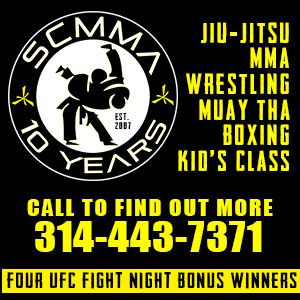 The St. Louis-area has a bumper crop of pro fighters inching and scratching their way to that next level with the goal of being, if not in the UFC, then on main card slots on promotions such as Bellator, RFA, World Series of Fighting, Titan FC and others. Hugh Pulley may very well be at the head class when it comes to such category. Pulley, 27, returns to competition in the main event of Saturday's KCFA 18 at the Truman Memorial Building in Independence, MO when he faces undefeated Grant Dawson in a lightweight match-up. Dawson is out the Glory MMA & Fitness, a gym ran by UFC's James Krause and houses other prominent Midwest fighters. Dawson is considered one of the star pupils out of Glory, putting together a stellar amateur run and sitting at 9-0 as a pro, all finishes, including seven submissions. "It's like the other fighters have been scared of the 'Legend of Grant Dawson' and they fear him," Pulley said. "I fear no man. He's a good fighter. He has some decent wrestling and decent hands, but he has tendencies that haven't been touched or challenged yet." Dawson is coming off a March TKO finish of Robert Washington on Titan FC 37. "I guess it's my turn," Pulley said of following in his fellow St. Louis lightweight's footsteps. "This was the best fight for me. I'm not intimidated by (the Washington fight). I know Rob wasn't performing at 100-percent. I've sparred with Rob and that wasn't him." Pulley's last loss was to Zach Bucia, who also fights out of Glory. But Pulley is a much-different fighter than that night in November, 2014. Pulley is 5-2. He sprinted out to a 4-0 start to his career, that included a first-round finish of Chad Williams. He then dropped two straight, to Bucia (15-7) and a few months later to Chad Curry (7-1). He came back at last summer's Bellator 138 and was pitted against Eric Irvin. Irvin (11-4) is a longtime regional standout who had won four straight coming into the contest. In a fight that was named 2015 STL MMA Pro Fight of the Year, Pulley came away with a split decision victory. While fans and media reveled in it, both Irvin and Pulley voiced criticism of their own performances. "It almost felt like a loss because I didn't finish him," Pulley said. "I didn't throw my hands like I wanted to. That wasn't even up to my potential. That felt like 50-60-percent." After the Irvin fight, Pulley didn't stop. Soon after he sandwiched in road trips to Florida and Indiana, picking up additional rounds, tips, and drills while out and about. "I learned from the Irvin fight that I had holes that I had to fix," Pulley said. "I took the Sunday and Monday off and then I was right back in the gym." Pulley, with the help of girlfriend Marissa Smith, has tightened up his lifestyle outside of the gym. "I never really knew how to cut weight before. Now that I have a girlfriend, that has all changed," he said. "I'm cutting the right way now. In that last fight I felt 100-percent." Pulley also works a shift supervisor for UPS, a company he has been with for seven years. Mostly the night shift, enduring steamy hours inside the Earth City warehouse coordinating schedules, deliveries and employees all flying at him like bats in a cave. "It can get intense," Pulley said. "It helps with the mental game." Aside from all of his physical gifts (Pulley is a large 155-er with a fun-to-watch skill set led by his judo and crafty striking) he appears to swim in a constant pool of positivity. While still hyper-critical of himself, he balances it out with semi-truck full of self-belief. "I am really, really critical," Pulley said. "But I want to be the best. Every fight is just another stepping stone to where I need to be. I dream every night about it. I feel like as long as I believe in myself no man is a threat to me." Pulley studies judo under Travis Johnson and it has become a valuable option in his tool belt. "The judo is what keeps me standing," Pulley said. "You can't get the takedown if you're getting thrown. I came into it from sort of a catch wrestling background. (Johnson) made it real easy for me. If wrestling is leverage then judo is the gears and cogs to that leverage." Pulley has long been based out of Modern Combat Systems. He gets his boxing from St. Louis' legendary trainer Buddy Shaw. He has a long support system, stretching out to the War Room in Wood River, Illinois and a collection of family and friends whose belief in him rivals the depths of his own. "They always know when to make that phone call that ends up really motivating me," he said. Catch the entire KCFA card streamed live on FloCombat, Saturday, April 30th.